A Complete Fried Peanut/Broad Beans Processing Unit, High Production. Fried peanut processing line is used to produce delicious peanut and broad beans, it includes blanching machine, peanut peeling machine, broad beans opening machine, frying machine, de-oiling machine, flavoring machine and vacuum-nitrogen packaging machine, according to the different needs of the customers, it has the large, medium and small scale. If you have other special requests for the fried peanut processing line, we can also customize it for you as your request. 1. The blanching machine is used to cook the peanut, let the peanut kernel red skin easy to peeling and keep the natural flavor of the peanut. 2. The peeling machine is a wet peeling machine, high peeling rate and no damage to the peanut. 3. For the broad beans, we should use the broad beans slitting machine for incision in order to make the beans easy to fry and can absorb the flavoring thoroughly and evenly. 4. Frying is a core step. The purpose of the frying is to reduce the moisture in the peanut and get the crispy peanut. When frying, please grasp the right time, neither too early nor too late. 6. The flavoring machine is used to season the peanut which makes the peanut more taste, the customers can season various flavors according to their own intention. 7. The last step is packing. Vacuum nitrogen packaging machine can finish large and high-efficiency packaging. Through the packing, the fried peanut can keep tasty and no damage for a long time. 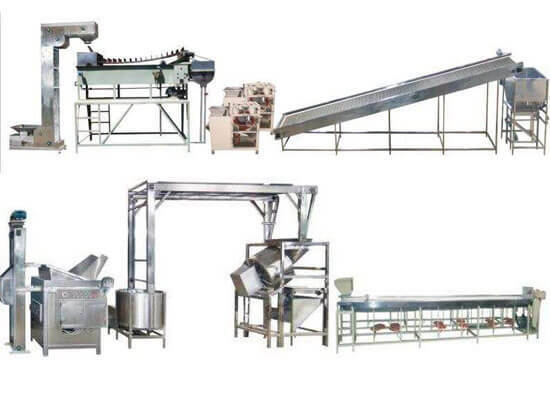 Our fried peanut processing equipment consists of 7 independent machines, you can according to your needs to choose. Our fried peanut processing equipment is very proper for hotel, supermarket, restaurant and peanut/broad beans food processing plant, etc.